Laying new roofing plywood ready for new felt. Bonding under felt to the plywood. Nick Hedley Roofing in Carlisle Cumbria pride ourselves on very high standards of workmanship, undertaking all felting personally. No shortcuts, no mess and a personal touch will ensure 100% satisfaction. 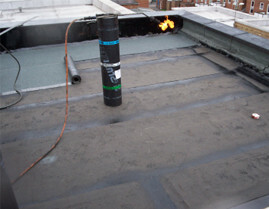 The following photos clearly demonstrate the attention to detail that goes into each and every one of our roofs. 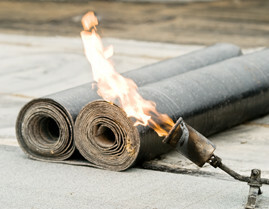 Much of our work involves the repair or replacement of existing flat roofs, many of which fail after less than a year. 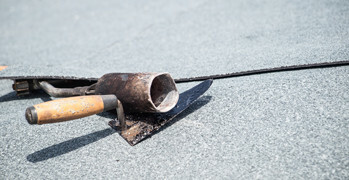 This is usually down to poor workmanship and inexperience by 'jack of all trades' or poor materials being used. 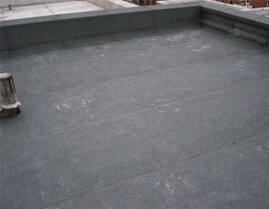 The main cause is because the first layer of felt is incorrectly bonded directly to the roof deck. 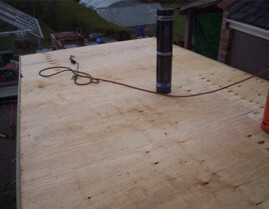 Seasonal variations in temperature cause natural expansion and contraction of the timber roof boards, causing the roof covering to split, crack and lift. Of course once even the smallest split has occurred, water will penetrate, damaging the roof structure as well as interior decor. To learn more about our professional felt roofing services, please fill in our CONTACT US FORM or get in touch in with us on one of the contact numbers below, we offer slate roofing services throughout Carlisle, Cumbria and the Borders.